Drones are everywhere nowadays. News channels use them to make footage of accidents or sights of interest. The military uses them for who knows what. And then we randomly hear about near hits between drones and planes. All of the drones we always hear about are flying drones. What about other kinds of drones? What about underwater drones? No, not the remote-controlled mini-subs that are used to check down in thousands of feet underwater. More the ones that we could use to scout out a wreck dive we want to do. Or, provide us with video footage of fantastic sites under water? Guess what – they do exist, and they are amazing! These underwater drones are equipped with cameras and lights, and you can send them down into lakes and oceans or any other kind of body of water. You can record and view all that they get into their sight without having to go into the water yourself. Now, don’t get us wrong, we love diving and snorkeling but how amazing is it to think that you can get a perfect underwater view of any of the sights while you’re relaxing on a boat and not risking to violate any decompression safety settings? You take your drone and send it underwater while you watch everything as if you were down there yourself. Only a few years ago underwater drones where super-expensive and no recreational diver would have been able to afford one. Nowadays, these drones are still expensive but no longer entirely out of reach. They are also easier to operate. The old min-subs that were used commercially required a lot of training to work them effectively and safely. Before you run to the next store to get your underwater drone, take a moment and have a look at the best ones we found at this time. And be aware that they are not cheap. Drones that fly often look slick and smooth and have gotten pretty competitive over the years. The ones that have to survive the pressure underwater are unfortunately quite a bit more expensive and often don't look that stylish! There are more and more consumer underwater drones hitting the market, and that will eventually bring down the prices tremendously. To make a choice simpler, we decided only to pick drones that are readily available. While you can read about many announced drones or drones where kickstarter or funding campaigns have started, we wanted to focus on the ones that you get and use. There are many different types of underwater drones. Compared to drones that there's a problem with transmitting the signals between the remote and the drone that's underwater. Wireless signals don't travel that well under water, and if you want a drone that can go to reasonable depths, you will need one that is connected by cable to the remote. That, in turn, does limit the depth you can reach as the length of the wire limits it. What drones can you get? Many different drones are available today that you can purchase. There are very cheap ones that you can use for videotaping in shallow waters down to about 10 feet. If you want a drone that reaches depths of 150 feet or more then you will have to have to open your wallet quite a bit farther. ​The PowerVision PowerRay Wizard is one of the slickest underwater drones you can find today. It resembles the shape of a ray and has terrific technology packed into it. The camera is integrated, and you can record in 4K UHD. It also allows you to shoot photos with a resolution of 12 MP giving you some impressive imagery when using the drone. Click here for the current price! The drone connects with a 164ft tether to the base station. Commands transmit through that cable which does restrict the depth naturally to the maximum length of the cable. 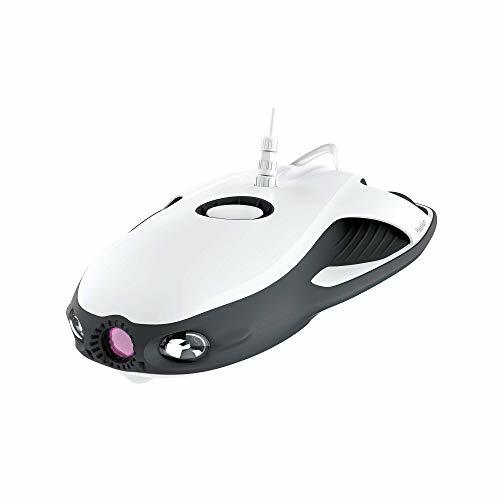 The batteries on the PowerRay last for up to 4 hours. The remote transmitter that's used by the operator connects wirelessly to the base station. 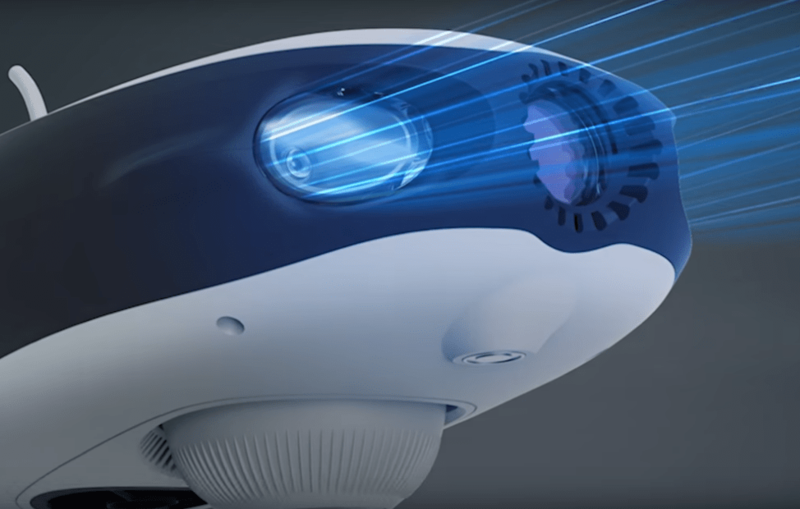 Besides changing direction, depth, and speed, you can also control the LED lighting in the drone to adapt and adjust visibility. A neat feature is that the drone comes with Zeiss VR One Plus googles. You can view the images taken with this VR headset as soon as the photos or video are received. The Vision+ mobile app runs on iOS and Android and provides real-time viewing of videos and pictures taken by the drone. It's as close to being down there underwater yourself as it gets! The feedback you can find is overall mixed. You'll need to have a solid understanding of drones to get the most out of this device. Assuming that you can drop it in the water and it magically does the video and photos and you'll have no problem working with the drone is not the case. You'll need to get used to how to operate the device. ​The Robosea Biki is a different kind of drone. And that’s not only because it looks like a fish. While for example the PowerVision PowerRay is connected by a tether and cable, the Biki is a drone that you pre-program and then send on its way. You can have it dive down to depths of up to 196 feet to take video or photos. Video can record in 4K quality. However, as the drone dives on a predetermined route without a real-time connection, you won't be able to see that imagery in real-time. It also means that you can't react to unforeseen circumstances as the route is preset and you can't adjust it on the fly. At very shallow depths you can use the remote to drive the Biki, but if you want to use it down below a few feet, you will have to use a preprogrammed dive route. If you do not have the Biki dive at all, then you actually can control it with an app on Android or iOS to have it swim on the surface. 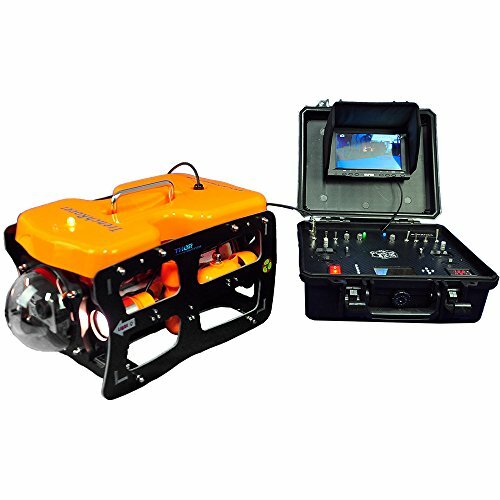 ​The ThorRobotics Trenchrover110 ROV Underwater Drone is an impressive underwater drone. It doesn't look as smooth and styled as some of the other drones we introduced, but it has some exciting capabilities in store. 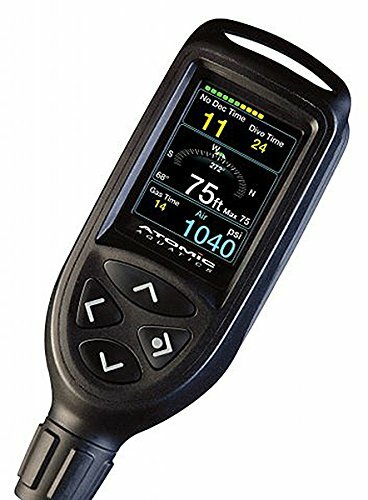 You control the Trenchrover 110 through a base station that is connected to the drone by cable. The maximum dive depth is 30 meters which is the length of the cable. This drone does have a built-in camera. Besides, you can place your GoPro or Sony HDR-AZ1 or compatible cameras into the drone to create videos and photos. By connecting your Android or iOS device, you can watch the images and video as they record. 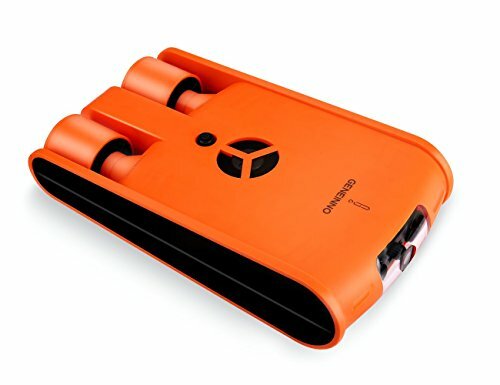 ​The Geneinno Poseidon I Underwater Drone is a fascinating device. It's neither shaped like a fish nor a ray but does in some ways outperform either one of the before mentioned drones. The drone is connected to the base station by a tether and communication cable. The tether offers a length of 328 feet with a maximum diving depth of 394 feet for the drone itself. No question that this is plenty of depth to have fun with the device! It features an HD camera with a 1080P resolution. You can capture full HD video or photos. To produce even better images, there’s a 120-degree wide angle lens on the camera, so you get a vast field of view for your pictures and video. You can watch the captured images in real-time on your mobile device. You link your mobile device (phone or tablet) to the base station through WiFi, and you can control the Poseidon through your screen! The Geneinno Poseidon I is built compact, so it's easy to travel with it. 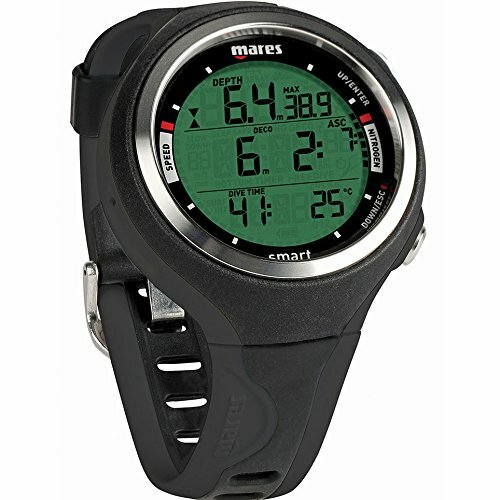 Being able to control the device in real-time makes it a blast to use and take video and photos during its dives. 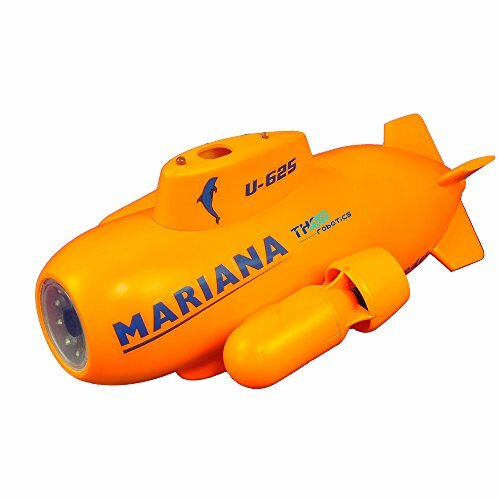 ​Should the ThorRobotics Underwater Drone Mini Mariana be called an underwater drone? It seems more like a toy. It's not in the same class as the other drones we listed before. While these can dive down to substantial depths, the Mariana can only dive to 3 m. This feature doesn't sound impressive at all at first sight, but it still can make a lot of fun and great images! It features a built-in HD camera. It's not 4K, but it does provide some reasonably good footage. You can have the camera record video or photos, and you can view them in real-time on your phone or tablet. With the remote control, you can adjust the speed, direction, and depth and trigger the camera. The maximum range of the remote is 100 meters so you can get some decent range when operating the drone. Well some of them are. Others not so much. 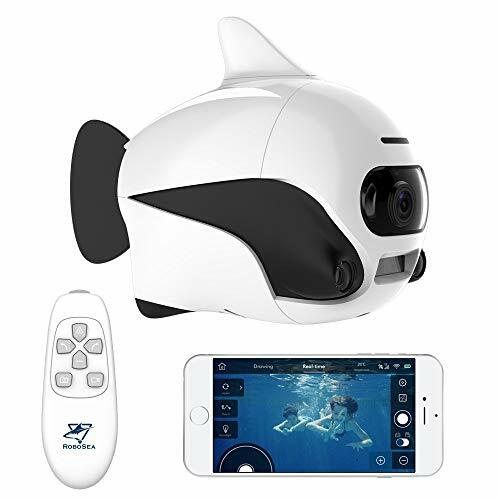 The price on the good ones is pretty high for something that's not much more than an exciting toy that can produce nice images and videos from underwater without you having to dive. We honestly think that it's more fun to scuba dive or snorkel yourself and experience the wonders underwater first hand. Photos and videos can be great fun but they don't replace first-hand experience. Trimix, simply put, is a blend of helium, oxygen, and nitrogen that allows divers to reach depths previously thought impossible. The exact percentage of the three will depend on the depth of the dive. 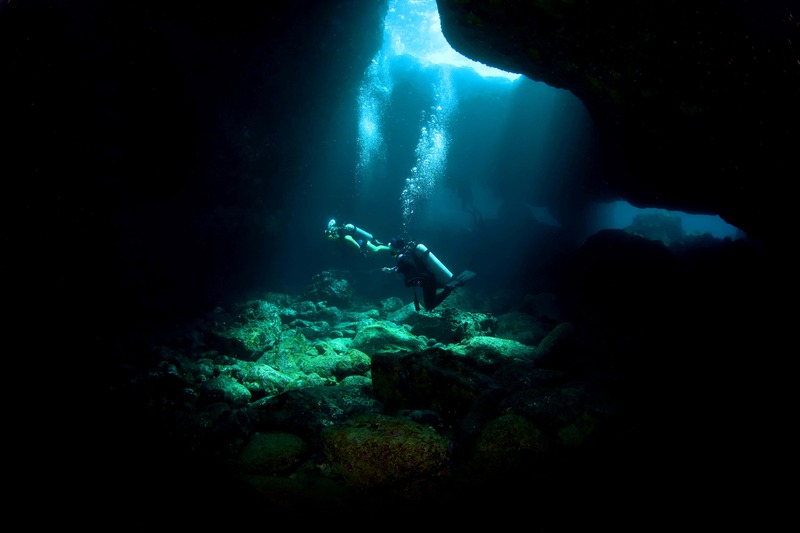 The deeper the dive plan, for instance, the amount of oxygen and nitrogen will be lowered and the helium increased to prevent nitrogen narcosis and oxygen toxicity. The math behind the exact percentages is quite precise and complex. What’s the history of Trimix? Oxygen and nitrogen are pretty standard when it comes to breathing gas, so you may be asking yourself why helium was chosen as the third element. For one, helium has a lower density, which is easier to breathe at extreme depths. With smaller bubbles than nitrogen, diffusion of helium in the tissues and blood is much faster and easier than other gases, lowering the risk for getting the Bends. Helium is also non-reactive with other chemicals and much less narcotic than nitrogen. Indeed, many divers express that they feel better after finished a dive with mixtures containing helium rather than solely nitrogen and oxygen, though the claims haven’t been empirically tested. Unlike some other breathing gas mixes, Trimix is reserved largely for professional or technical divers. Recreational divers generally wouldn’t reach the depths necessary for these special measures. We’ll talk a bit later on why this mixture is reserved for specialized use. 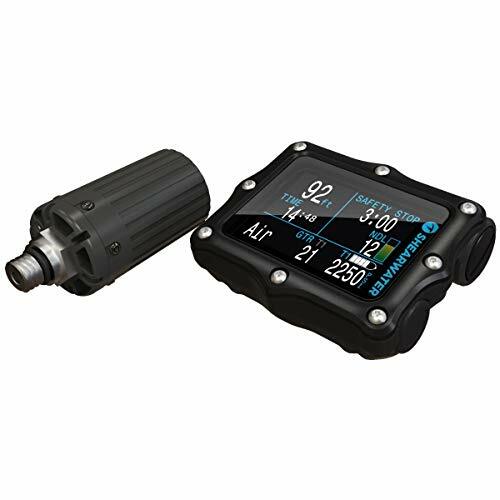 Trimix is one of the advances in the world of scuba diving that we can attribute to the military. At the end of World War II, the US military and British navy began to experiment with diving technology, to see if they could reach new depths. One of the experiments that they conducted was around the use of Helium in saturation diving to reach sunken military equipment. For a few decades, the results of these studies didn’t branch out of military circles, but by the 70s and 80s, helium mixtures were being used by technical divers for cave diving. A decade later, practices were being standardized in terms of training, making trimix more widely accessible than it was just thirty years before. Today, trimix is used for pretty much any dive that exceeds 150 ft. Since helium seems to be a cure-all for issues of toxicity and narcosis, it’s interesting that not all tanks are filled with the stuff. But there are a few good reasons why it’s not more commonly used. For one thing, helium comes with additional expense. This is largely due to the fact that it’s not that easy to get and it requires special training. 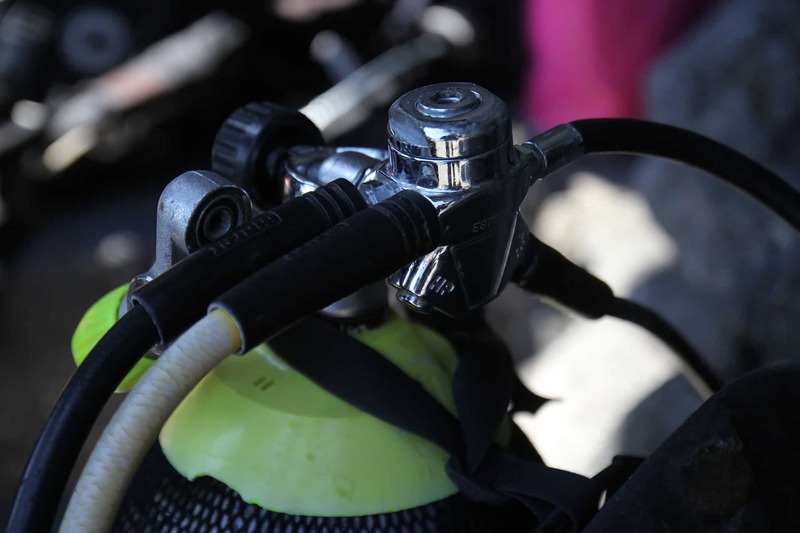 Decompression with trimix is slightly more complicated than traditional mixtures, so divers must be trained on how to avoid decompression sickness. Another disadvantage to helium is that it lowers body temperature and puts divers at higher risk for a condition called High Pressure Nervous System or HPNS. Once called helium tremors, this condition can sometimes occur for dives exceeding 600 fsw and manifests in fatigue, nausea, shaking, and cognitive disruptions. While very uncommon, researchers still worry about this risk of breathing helium. Even with these drawbacks, mixes that utilize helium are overall very safe and even preferable to more standard breathing gases. 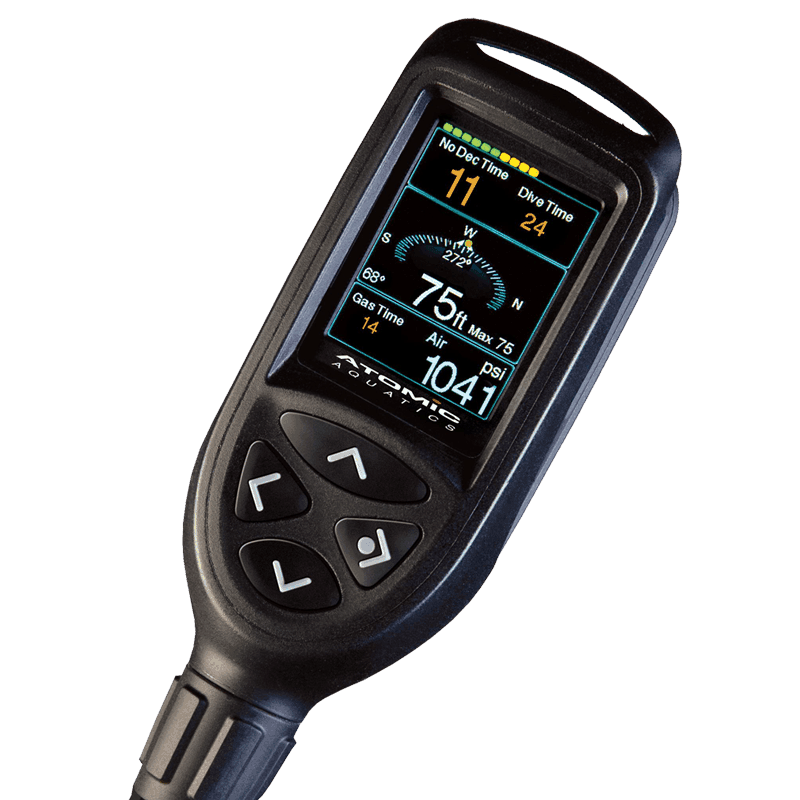 Trimix isn’t something that you would simply put in your tank and dive as normal. There are a lot of factors that go into finding the right mixture, and you should be prepared to take a few classes to get certified in using trimix. Check with your local dive community to learn more about prerequisites and opportunities to join a class. For PADI certification in Trimix, for instance, you need to have a PADI Tec 65 Diver certification as well as 100 logged dives. You must also be over 18 years old and have medical clearance. In a class like this, you’ll learn key skills like planning trimix mixtures for different depths, handling multiple decompression cylinders, use of decompression software and multi-gas computers. You’ll also, of course, learn how to deal with emergency situations, which is extremely important the deeper you plan to dive. An initial class on trimix with PADI would allow you dive to depths of 210 feet (or 65 meters) or less, meaning that there is still more to learn on the topic of trimix before you can think about diving even deeper. For those who are contemplating becoming certified in trimix, it’s a good idea to do extensive research on the ins and outs of how to use the breathing gas. With a solid theoretical base, you’ll be sure to enjoy your certification classes and be safer in the real-world environment! Children appreciate family trips, especially when they get older. They can look back at all of the fun activities that they did with their parents. Snorkeling with children is one such activity that involves some skill and the right gear. Children can learn this sport and enjoy it throughout their lives. After all, who doesn't love to poke their head underwater and take a gander at the fish? The following will present more information regarding enjoying this activity with your kids. Children can start this activity quite young. Trip Savvy goes so far as to say that kids can start at four or five years old. The European Child Safety Organization provides more in-depth information on this matter. Kids need to know how to use the snorkeling gear before they go into the water. They should also still be wearing flotation devices, even if they are proficient swimmers. There are basic hand signals that need to be mastered as well. Kids also need to be taught to not reach out and grab what they see. Even if it is plant life, the motto should be, look, but don't touch. This can be especially important because coral is sharp and can cut and scrape people up pretty badly. 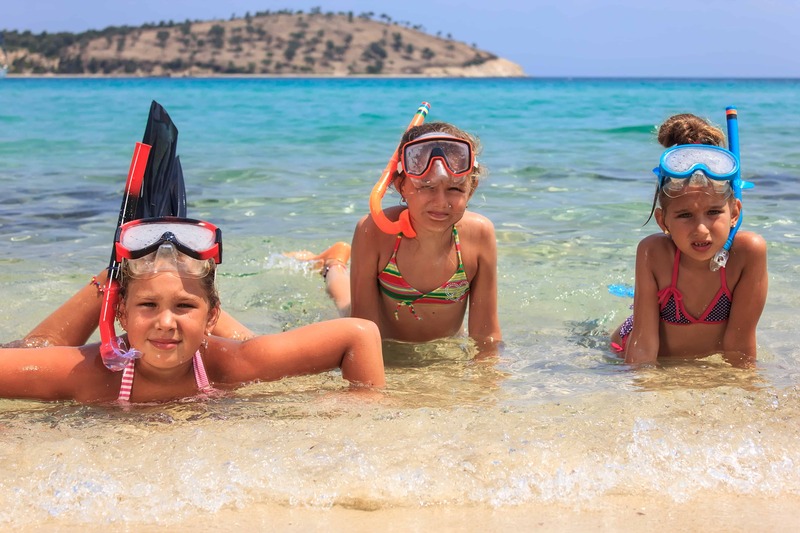 Parents need to ensure that the snorkeling space is safe - for example, they should take their children to areas with reefs so that the children are not swimming out in the open. Also, parents need to tell their kids not to go into little coves. It’s easy for a kid to get curious and try to explore a cove or cave that has a lot of fish. These kinds of situations can easily lead to finding other sea life like eels which often can get children scared. This is not a pleasant surprise for a child. 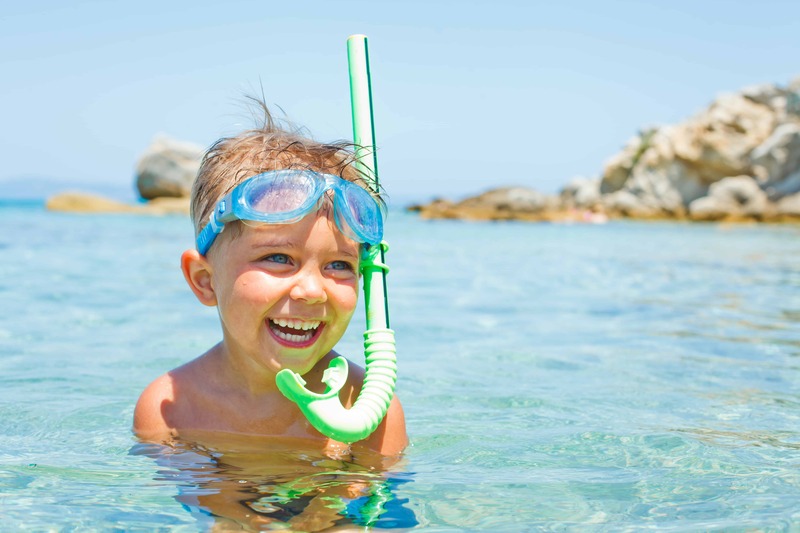 Children require pretty much the same snorkel gear that adults need. Yet, a couple of sizes smaller. There will be no joy for a kid to go snorkeling when the fins or mask don’t fit because they are too large. 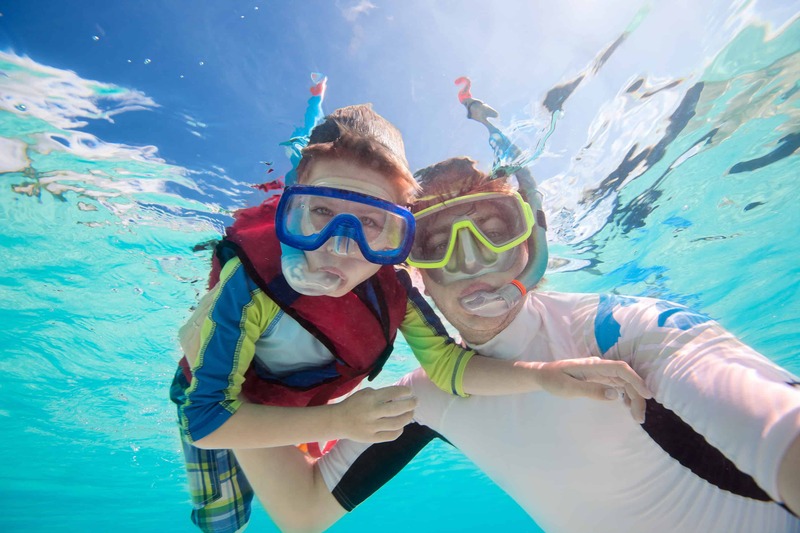 The typical gear your child will require are mask, snorkel and fins. All of those can usually be gotten in sizes that match your children’s height and age. It’s easy to understand that the fins need to be the right size for the kid’s feet. Otherwise, he or she will constantly slip out of them or they will be too tight if they are too small. Both will ruin the fun instantly. When purchasing fins for children, adjustable fins are an option. This budget friendly buy can be adjusted as the child grows up. A mask that’s not fitting right will leak and let water inside. This in turn will end any snorkeling adventure pretty quickly as it’s no fun to having to clear out he mask all the time. Lastly, a snorkel that is not a dry-top snorkel will make it harder for the child. Especially in the beginning, it will be happening that your child will be getting too low into the water and the snorkel can submerge. If the snorkel is not dry then trying to take a breath will result in a lot of water coming in through the snorkel. The result being that your child has to come up and cough and ends up not liking the whole experience. If you use a traditional setup with a mask and a snorkel then you also need to make sure that the mouth piece is small enough to fit into your child’s mouth. If it’s too large then it will hurt the kid’s mouth and make it impossible to breathe normally. A newer and better way might be to get a snorkel mask covering the whole face for your child. 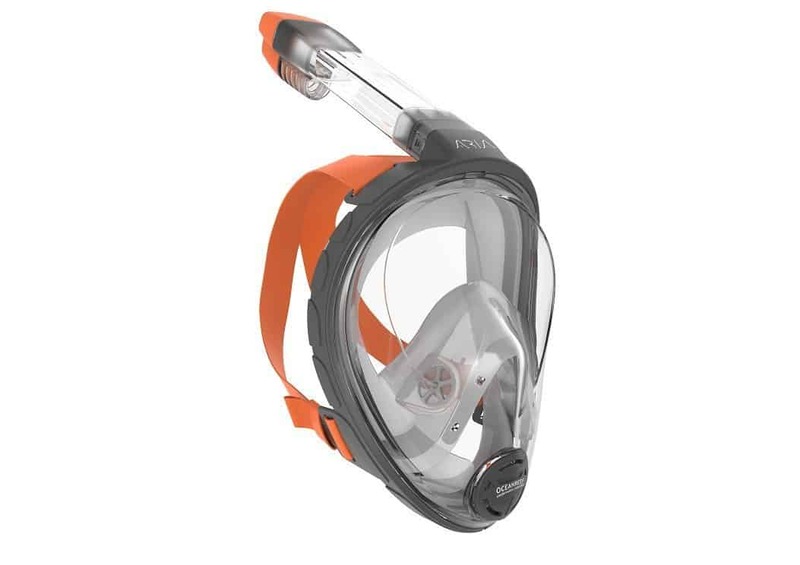 They provide better visibility under water and make it a lot easier and comfortable to breathe. Many of them come in sizes specifically fitting children. Make sure that you only purchase quality items. It can be a safety concern to have for example masks of low quality. The lens could be made from cheap material that breaks apart and could cut the face or the eyes of your child! People often do not know how to start their children with this sport. According to the European Child Safety Organization, the best place to begin is on land. The reasoning behind this is that children need time to practice before getting into the water. Even if an adult picks up the skill quickly, that does not mean that the child will learn as rapidly. Two of the major concerns that ECSO suggests are that children need to learn how to breathe through the tube and keep the mask clear. The child might have to learn to do both at the same time if the tube clogs up at the same time as the mask blurs. They must be adept enough not to panic, but instead simply blow through the tube to clear the airway. 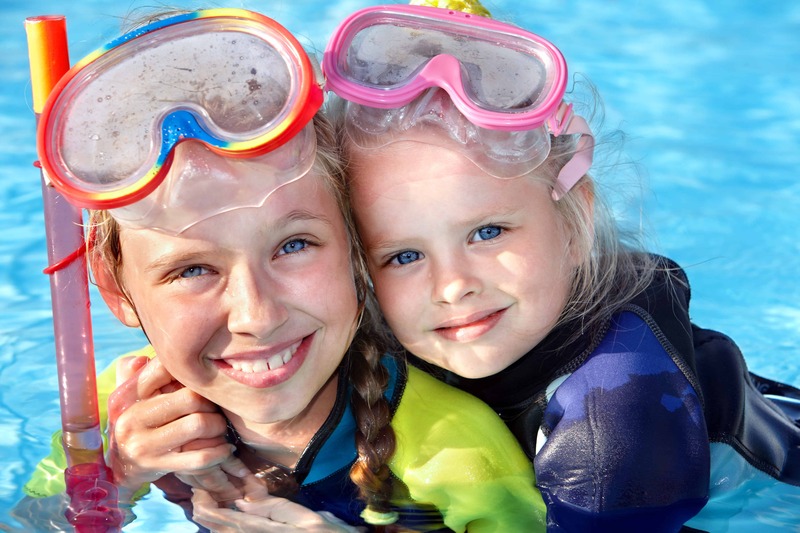 Dr. Orlena Kerek suggests in her blog that children can then get used to the breathing aspect in a pool. They will be able to learn the coordinate motions that go with swimming and using the gear. Once the child has become adept, the ultimate goal is the ocean. After all, they won't see fish in a swimming pool. Many resorts will vie for visits from a family that loves to adventure and snorkel. 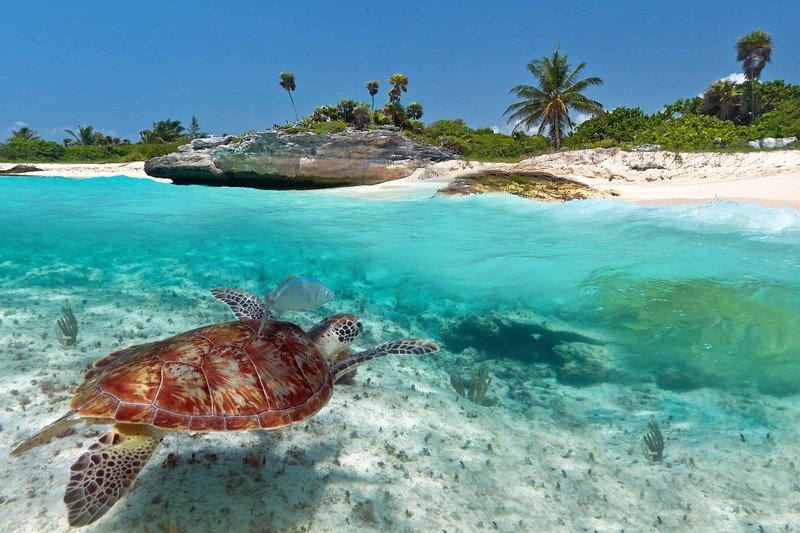 The Travel Chanel suggests some destinations on their site - https://www.travelchannel.com/interests/beaches/photos/best-us-caribbean-snorkeling-resorts. Most of their picks involve not leaving the resort property. This might be ideal as the family learns to adventure together. National Geographic offers some advice as well (https://www.nationalgeographiclodges.com/about-our-lodges/best-of-lists/best-family-getaways/#.WtBLyIjwbIU). Generations of families that visit Petit St. Vincent Private Island continue to pass snorkeling onto their children. The entire family can enjoy snorkeling together. It will take a while to acclimate the children, but once this happens, the clan will benefit from the sea's sights. There is a cornucopia of color and life below the surface of the water. It is waiting to be explored. The ventures are fairly low risk, especially if the family chooses to stay in resorts that cater to snorkeler's. And with a little preparation, the family can take to the seas and inhale the open air. Be sure to follow safety precautions because they are there for one's safety. It is best to ask the locals and hotel owners about any tips when staying on their beaches. They, after all, are trained to keep up to date with the latest weather and nautical conditions. One of the issues with scuba diving and snorkeling is that the masks can be a problem when you wear glasses and ruin the fun in or under the water. Depending on how strong your need for eye correction is you might not have to worry about it at all. That is not true when you are far sighted and need reading glasses. 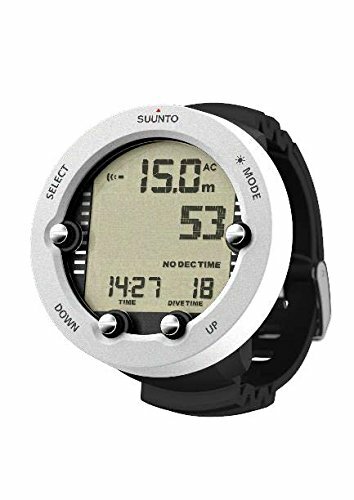 You will need to be able to clearly read your gauges and that means that you somehow need to correct your reading vision while diving. For snorkeling that might not be true as you don’t have gauges to read that you’re safety depends on. A dive mask will make any surrounding object around you appear larger and closer than they really are. If you’re just a little near sighted then this automatic correction of the scuba lenses might be enough so you can dive or snorkel without needing your glasses. There are a few options available when you’re near sighted to be able to enjoy your dive or snorkeling. First, you can certainly wear your glasses and have some water drip into the mask. In many cases, it’ll end up being quite a lot of water as the skirt cannot create a tight seal with your skin. If your glasses have thin and flexible arms then it might work. Otherwise, the leaking will pretty much be unavoidable. There are divers that will take an old pair of glasses and remove the arms of the glasses. Then you can place the glasses or your nose or mount them inside the mask. However, it will be a problem to keep the glasses in the right position and you can’t adjust them when you’re under water. Another problem is that standard glasses tend to fog up and without being able to take the mask off to clean the glasses you’ll have a hard time to see anything. Another approach is to use contact lenses. These can work ok but if you’re not careful you could lose them if you get water in your eyes while wearing them. Some people have no problem wearing contacts in water while others cannot do that at all. If you can deal with it then it can be a great option for you. One advantage you definitely have with contact is that they won’t fog up! One of the first possible solutions that was invented and at times is used until today is to glue corrective lenses onto the lenses of your mask. You will need to have special lenses created that have a flat surface on one side. The side with the flat surface is what is glued against the flat lens of the mask. Most masks have flat glass so gluing the corrective lenses into the mask works pretty well. The advantage of this method is that you can have the lenses match your prescription exactly including any other correction that is needed like astigmatism or even bifocals. You can glue them in the exact place you want and get excellent visibility that way. One thing to be considered is that the lenses have to be in the right position in your mask. If they are not in the right spot then you can’t comfortably look out of your mask. Depending on the size of your head and the distance of your eyes, the lenses have to be glued in in the right location to make the mask work properly. However, there are not only advantages to this method. One of the problems you can have is that sometimes these corrective lenses are very thick if you need a large correction of your eyesight. If you have glasses with more than five diopters and regular glass is used then the lenses will be very thick. As the lens needs to be flat on one side you end up with a large curve on the inside of your lens. Your visibility can get negatively impacted that way as you get a lot of distortion. Newer lenses for prescription glasses often use plastics which can be thinner and lighter and provide less of such an issue. Another problem with glued in lenses is that they don’t have the same size and shape as the visor of your mask. This can make it quite difficult to effectively clean around the lenses. Eventually, you will have some dirt collect around the edge of the lens. Using this approach is somewhat final for the mask you’re using. If you buy a new mask and it doesn’t fit you well then you usually will not be able to get your corrective lenses out again. You want to make sure that the mask will fit you well before you glue the lenses in. That way you make sure that it is the right mask for you. When you’re ready to have the lenses made and places you will have to find an optician that can handle that placement. 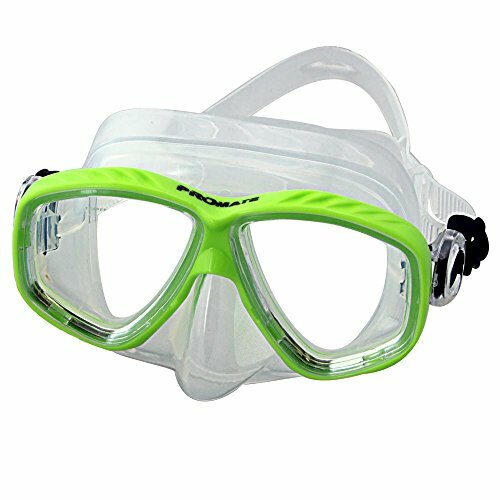 This is a reasonable approach to get a corrective dive or snorkel mask that will allow you to see clearly in the water! 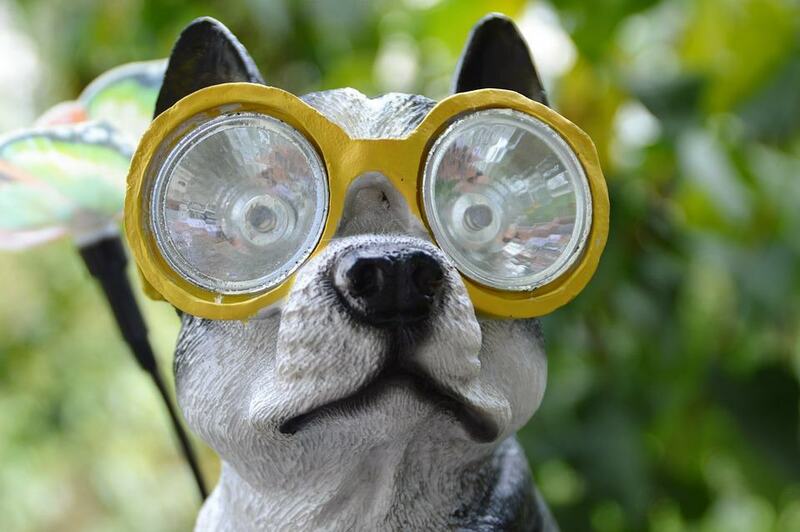 If you buy a mask with split lenses, then it can be possible to replace the lenses in the mask with corrective lenses that are specific to your visibility needs. This does sound easier than it is as you have to get the corrective lenses to match exactly the lenses you replace. On top of that, the lenses in high quality masks are made from tempered glass. You do not want to replace them with standard glass or with plastic lenses as they can break easier and cause injury if you have an accident under water. This option also only works if you get a mask with a frame. Frameless masks usually have the skirt bonded to the lens and as such you can’t just replace the lens without basically destroying (or at least risking destroying) the mask itself. Some dive stores specialize to help with finding a good mask and getting the lenses replaced. If you find a specialist, then this is a great option. However, you can’t typically get this done online for a cheap price! These masks are specifically designed to have lenses with corrections. 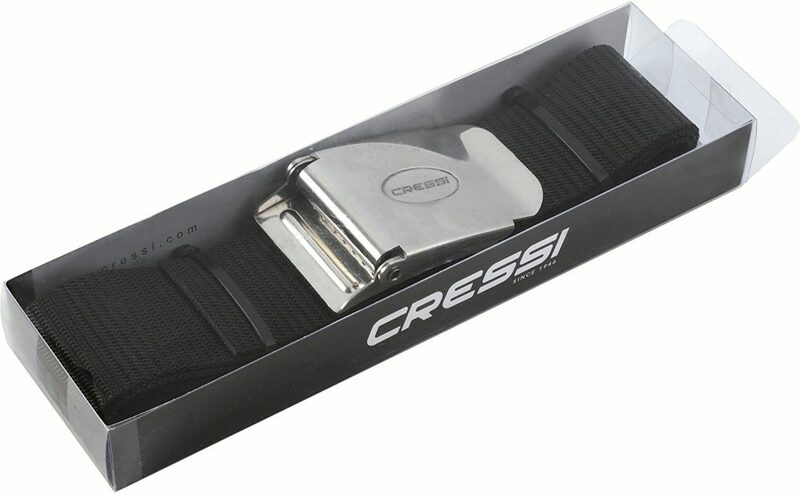 You can usually find them online as well as in dive shops for reasonable prices. This option works really well if you can find lenses that match your correction needs closely. You will typically be able to get the lens corrections within 0.5 diopters. This might not provide perfect visibility but is usually a tremendous improvement over diving or snorkeling without correction at all. What these off-the-shelf masks cannot fix is if you require severe astigmatic correction. If you require a slight astigmatic correction or have just minor trouble with nearsightedness yet require a severe correction to see in distance then you can consider this type of masks and fix the major visibility issue. You will not get a perfect match for correction with these types of masks. However, they are cheaper and pretty quickly available and as such they are a great alternative to the other methods and approaches outlined above. 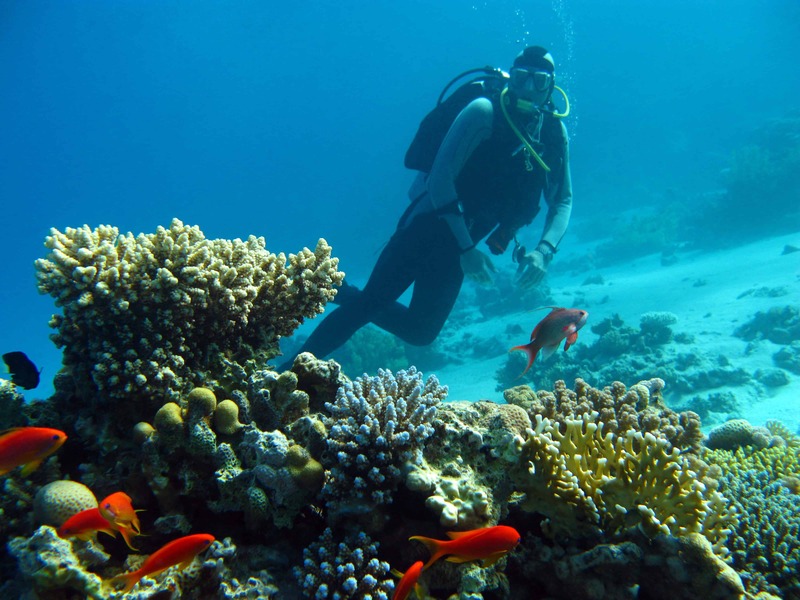 There are a number of different corrective dive and snorkel masks you can find online. These are easy to get and affordable. 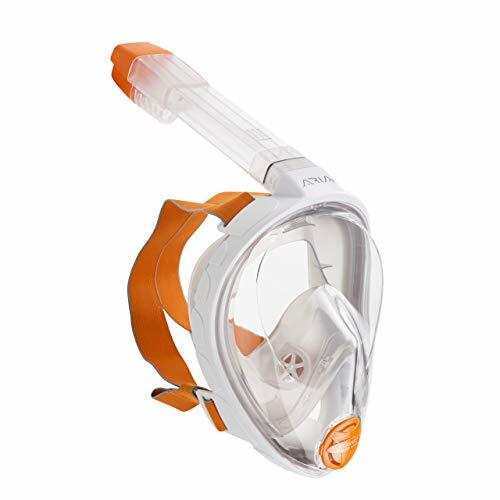 This specific mask is designed and manufactured with high-quality materials and is in any way equivalent to a good dive mask you buy without corrective lenses. The lenses are tempered glass and you can get a variety of different corrections. Promate included even bifocal choices with this mask. You can get the lenses for far or near sightedness and you can mix and match as needed. The increments are by half a diopter and you can get corrective lenses up to +4.0 and -10.0 diopter! This mask is with no doubt an overall great scuba masks. Even if you don’t need corrective lenses this mask is a good buy! This mask provides options for corrective lenses for nearsightedness. There are no options for farsightedness or bifocals. It is a well-designed mask made from good quality material. The lenses are tempered glass and work well. People have mentioned that the mask leaks. You will have to make sure that this mask fits you and adjust as necessary to prevent any leakage! In our opinion this is a good mask but it’s not as well designed and built as the Promate mask mentioned above. This is another mask from Promate but it is more geared towards snorkeling. 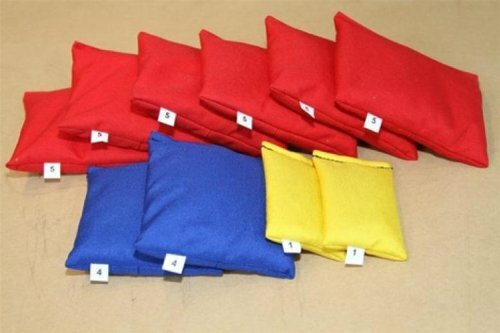 It is made from good quality material that are perfectly aligned with your requirements if you go snorkeling. You can get corrective lenses for nearsightedness. The correction range is 0.0 to -10.0 diopter in 0.5 increments. The mask comes in a variety of colors and has a clear skirt to increase visibility to the edges. 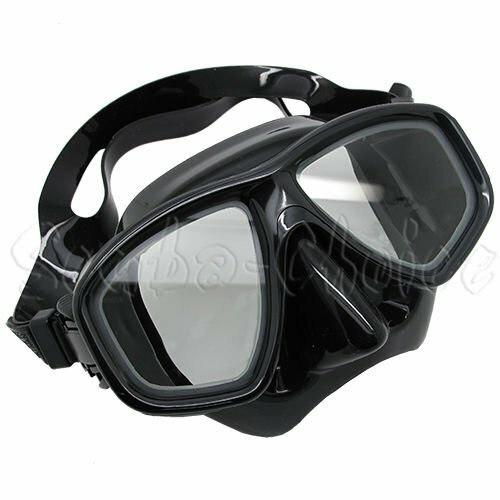 For scuba diving we’d suggest to go with the above mentioned Promate scuba mask. This mask is great for snorkeling but you do only get corrective lenses for nearsightedness! 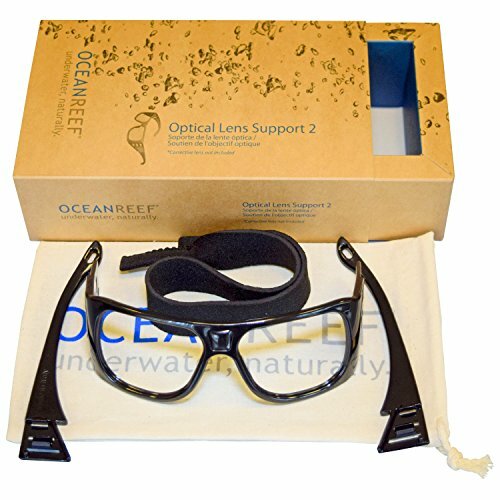 OceanReef offers an optional accessory that allows you to wear prescription lenses inside the Aria full face snorkel mask. You order the accessory and then have your prescription lenses fitted into the frames. The advantage obviously is that you get perfectly matching lenses for your correction needs. Not only that, you’re able to use a full-face mask for snorkeling which in our opinion are superior as they provide better visibility and comfort. 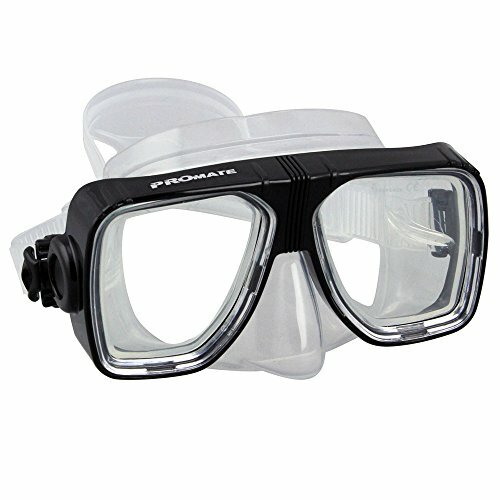 If you are into snorkeling and need prescription glasses then this is pretty much the best choice there is. It’s not useful in any way for scuba diving though. You can even try (usually successful) to combine the accessory with other full face snorkel masks. 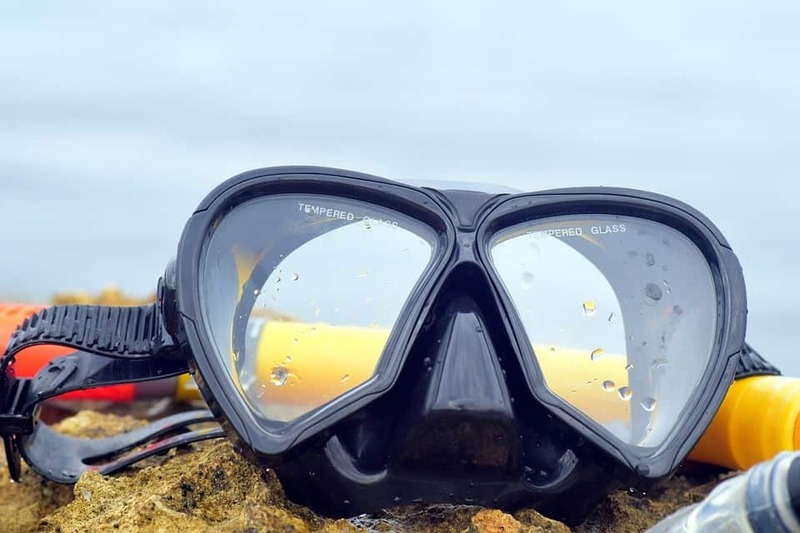 There are a number of options available for both snorkeling and scuba diving with regards to prescription lenses. Typically the best are to use off-the-shelf masks with optical corrections as close to your needs as possible. For snorkeling you definitely want to have a closer look at the OceanReef Aria with the lens support accessory. You get perfectly matched lenses and combine them with a full face snorkel mask. It’s hard to imagine a better combination for snorkeling. Scuba divers should have a closer look at the Promate scuba diving mask. It offers many lens options and by itself is a high quality mask. Have a great time on your next dive or snorkel trip! If you’re not living in moderate and tropical climates then one thing you do face is that bodies of water can be frozen during winter. 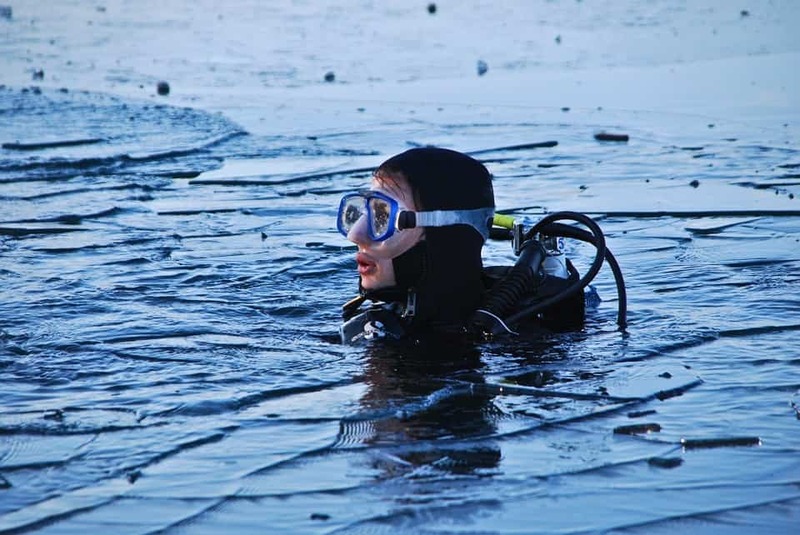 This opens an opportunity for many (or few) divers to go ice diving and explore a lake underneath the solid ice. Can you or can you not break through? One question if you’re interested in looking at this type of diving might be whether you could break through the ice from underneath in case you had to. What do you think? Can you or not? Well, the short answer is: it somewhat depends but usually not. If you have a solid layer of ice on top of a lake then there’s pretty much no way that you could break through that layer from below. You simply don’t have the leverage to do so. And no leverage then you also have no chance to break through the ice as it is quite sturdy as you might find out yourself if you ever try. How thin does it have to be to break it? If it’s a really (and yes, we mean really!) thin layer of ice then you potentially can get through. Otherwise, there’s pretty much no way as you can’t get enough power to break the ice. Technically, you might have a chance to get through the ice with a pointy and sharp knife. Yet, even that often won’t work. The ice is way strong and sturdier than you would expect and anything thicker than a few millimeters will simply be too think and sturdy to get through. All energy you can create to push against the ice is pretty much immediately lost once you hit the ice. And while you might think that the layer of ice is not very thick, it unfortunately is spread out pretty wide. And that absorbs pretty much any energy you can bring up from underneath. It’s similar to the windshield of your car. You might think that a strong push against he glass or even a stroke with a hammer would break it. Yet, that’s not the case. The energy from the stroke or push gets absorbed as you’re not able to concentrate the energy in a little pin-point. Using instead a nail that you hold against the glass and then stroke the nail even pretty lightly with a hammer will get the glass to crack. It’s similar with ice. If you push against it you’re basically the blunt hammer. The energy you produce gets absorbed without any serious damage to the ice. If you could concentrate your energy to a tiny point then you possibly can break through even if it only would be a hole big enough to poke your snorkel through. So, in short, ice diving can be amazing and fun but there are risks to it. Breaking through the ice sounds like a nice emergency plan yet don’t count on it. If you’re running out of air and have a frozen sheet of ice above your head you will be in trouble! Diving is a complex sport that requires precision, skill, and confidence. It is extremely important to be prepared, in all ways, before embarking on an underwater dive journey. Having the proper gear is a part of that necessary preparation. Divers, most times, desire to carry a camera on their dive. 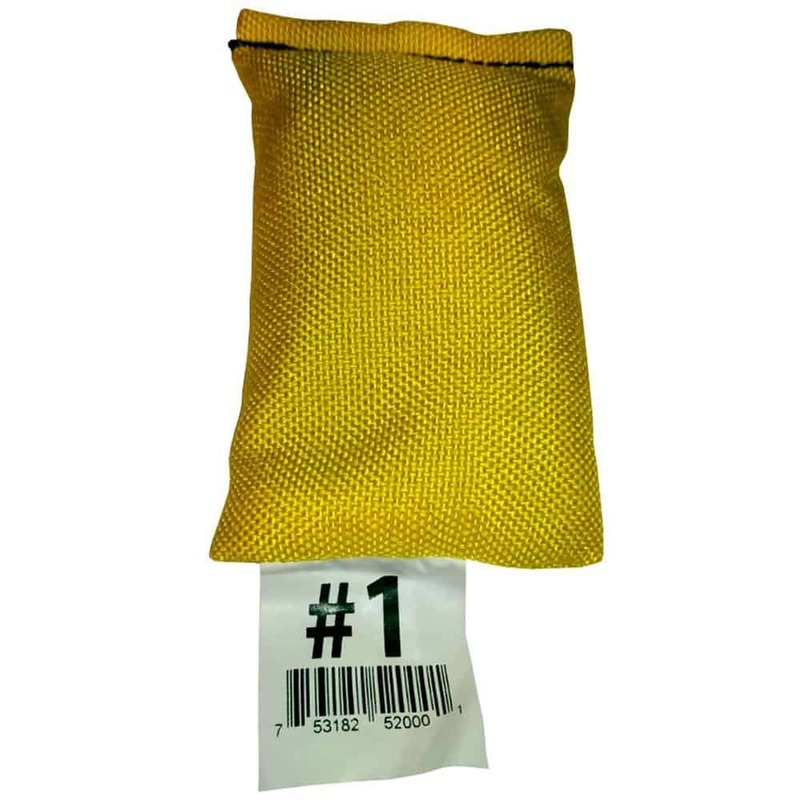 Although it is not of absolute importance, it is an item that helps divers make lasting memories. The GoPro camera is one camera option that can be used for diving. This camera has been around for quite some time, and is an excellent source for imaging. The GoPro camera company was introduced in 2002 by a man named Nick Woodman. The first camera opened up in 2004 at 35mm, and has grown ever since. The GoPro Camera Company has boomed since their original opening in 2002, creating a large group of followers. The purpose of creating this camera was to have a better way to film adventurous activities. Nick is a surfer, skier, and motorsport enthusiast and he wanted a better way to film his adventures. The GoPro was created specifically for this reason and it also came with a wrist watch. His camera started from supplies of old wetsuits and plastic, and it eventually advanced and became highly technological. This company has grown tremendously and is quite well-known throughout the world, today. GoPro is, now, an international company that is available in over 100 countries and they have sold over 26 million cameras. The passion of this camera company and the passion of their adventurous users bring thrill, inspiration, and celebration of life to reality. Depending of which GoPro camera you purchase, the deepness and specifications will be different. GoPro, now, has four different models that are on the market. These models are the Hero Black 6, The Hero Black 5, the Hero Session 5, and the Fusion. The design of each camera is different, but each camera has waterproof technology for going deep. The Hero Black 6, the Hero Black 5, and the Hero Session 5 all have waterproof design that lets the camera go up to 33 feet deep (10 meters). The Fusion model does not have the capacity to go that deep, but can reach up to 16 feet deep (5 meters). Due to this, GoPro cameras have built-in technology for going underwater for long lengths of time. When you go diving, you will want to decide how deep you are going, what your goals are when you are diving, and why you are carrying a camera with you. The waterproof technology of the GoPro camera helps divers of all capacities. 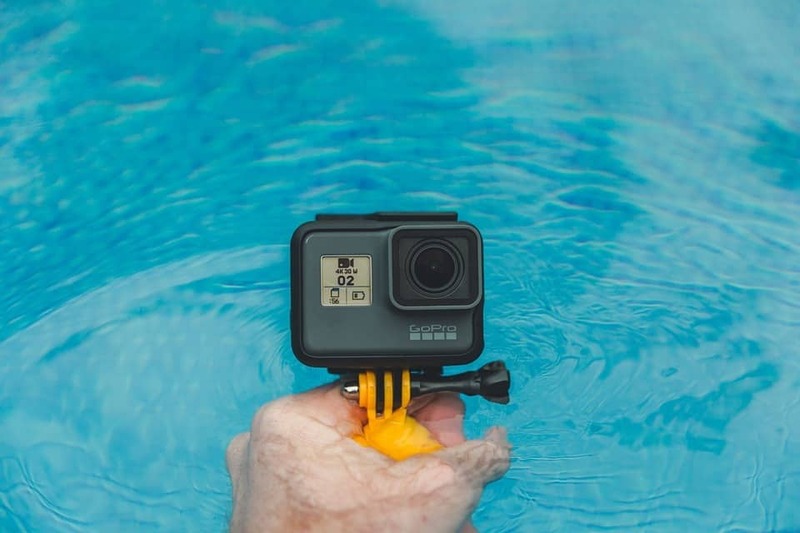 If your camera bursts or breaks when you are diving, GoPro will exchange the camera at no additional cost, presenting you with a brand new one as well as backed up iCloud data. When you are planning to dive, you should first decide where you are going and what you want to see. This will determine how deep you go. When people begin to dive, they will usually not surpass 33 feet. Yet, if you become more advanced or continue diving and want to take your skill further, it is possible to go beyond 33 feet deep. Due to this, it is important to decide what your diving goals are and then you can determine if it fits in the range of the GoPro. Through research, technology, and change, this camera remains as one of the top leading underwater cameras. There are a few alternative cameras and each one goes a certain depth. Most camera companies have underwater options, such as Canon, Olympus, Sony, and Nikon. There are many companies that have waterproof technology that let their cameras range up to 130 feet underwater and some even surpass 130 feet. Most of these cameras need housing to go this deep to remain waterproof. A few popular models to consider are the Canon Powershot ELPH 300, the Nikon D810, the Panasonic LUMIX DMC-LX100, and the Sony Cyber-Shot DSC-RX100. Each model goes to a different depth, but all of these models have the capacity to go to 130 feet and some of them, such as the Nikon D810 and the Panasonic LUMIX DMC-LX100 have the capacity to go over 300 feet, ranging around 330 feet. The GoPro is a camera for the adventurist who wants to enjoy their life and capture it all at the same time. If you are going diving at a beginner level, the GoPro is the perfect camera. 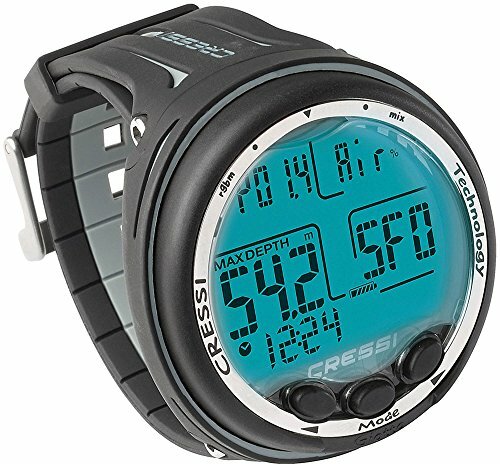 It is compact, well-designed, and helps capture life’s exciting moments without even trying. The products of GoPro are designed to keep things contained while being reckless, and even if your camera breaks or bursts, GoPro will still replace your camera. This camera is recommended, unless you are out for something more professional and in need to go a lot deeper than the GoPro camera offers. Diving is a complex sport and it’s adventurous thrill attracts people from all over the world. Whether you are going to have fun with your friends or to practice your diving skills, you will not be disappointed. Capturing your dives and playful moments underwater is an amazing attraction, and if any camera does it right, it would be GoPro. Diving is a sport that has become quite popular over the years. In fact, diving has risen in popularity in almost every country that has access to oceans or other bodies of water. 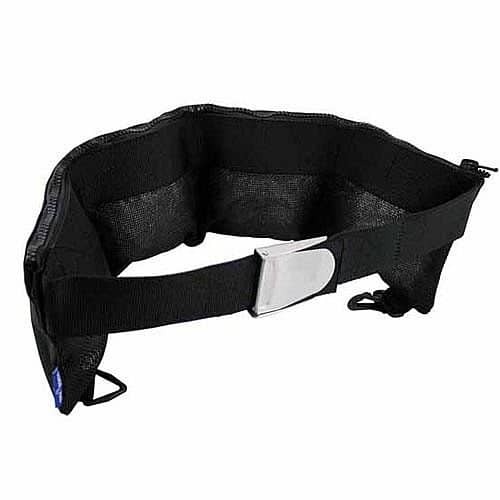 When people decide to take part in the sport, having the proper technique is not only a necessity for the activity, but it is also a requirement for the health of all divers. 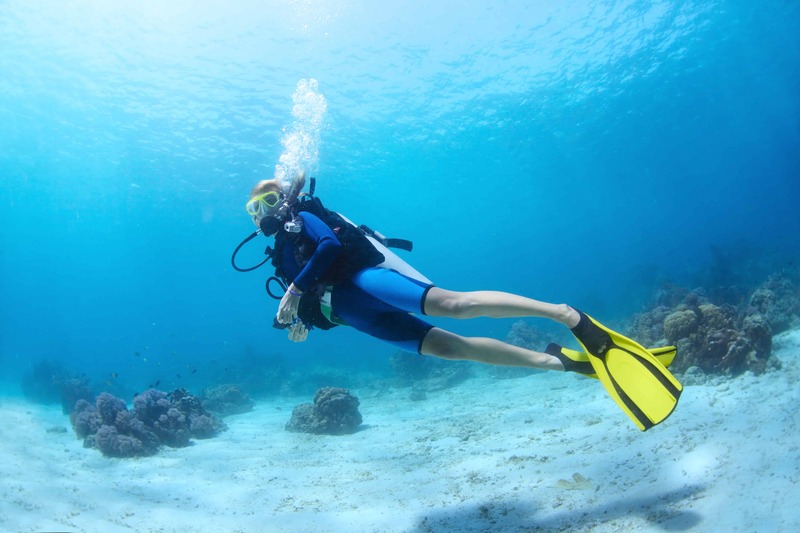 A health concern that has become common, while diving, is ear pain. Although most people do not have health issues concerning their ears, heading down into deep oceans can trigger this health concern. Understanding why diving triggers ear pain, how to prevent it, and how to fix these ailments can make all the difference in the world when taking part in this wondrous underwater sport. When you jump in the ocean, you will notice the water has quite an impact on your body simply because your surrounding environment is changing. This happens when you go on an airplane, as well, because the pressure will be different than what your body is used to on a normal day-to-day basis. When you submerge your body in water, it lets you float, swim, and breeze through its substance. Yet, water also acts as pressure against the human body. The biggest reason you with develop ear pain is because the pressure of the outside environment you are in is different than the pressure inside your middle ear. This is called “ear squeeze” because the air does not flow through your ears fast enough, even though the tunnel in your ear is opening up to allow it in. If you do not let the pressure equalize, your eardrum will be in danger of popping. It can heal, but diving will have to stop during that time. If the pressure does not clear, you may come out of the water with something called barotrauma, which causes lingering pain after you dive. 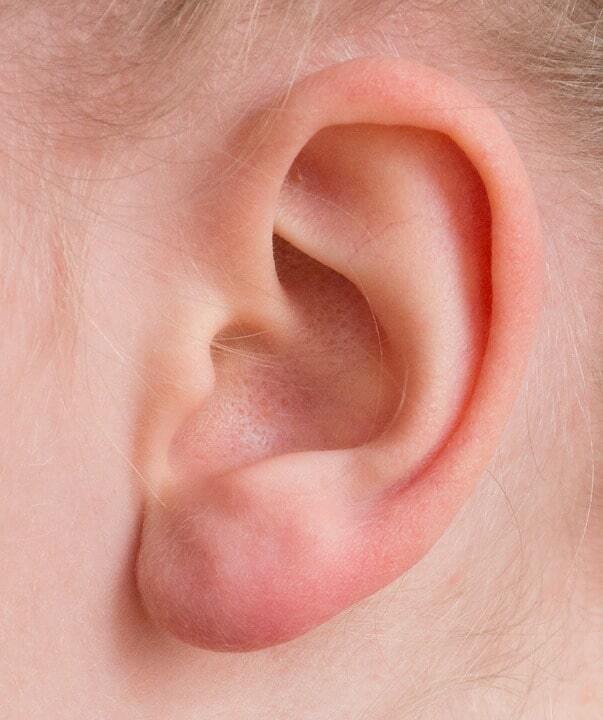 Ear pain often occurs when there are respiratory issues, such as allergies or colds, that are not cleared up. Any bit of mucus will contribute to your ear pain because it will interrupt the natural equalization process. When you are in the water, you want to make sure that you allow air to flow through your ears when the tunnels of your ears open up. The pressure needs to stabilize in your ears when the pressure of your environment changes. When you go down underwater, you want to make sure that you yawn, swallow, and allow air through your ears. 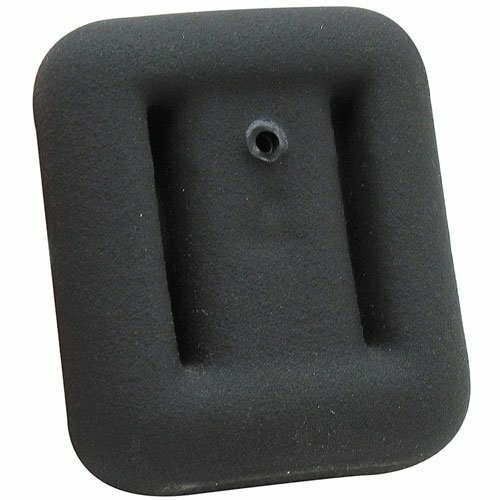 There are a number of equalization techniques that you can apply to prevent any issues with pressure in your ear. You, also, want to let the pressure change at a rate that your ear can catch up with. Doing this can help with your ear pain. You may want to float up if you notice pain in your ears because your ear may need to catch up. Sometimes, you will receive ear pain because the pressure changes at a quick rate and your ear does not have enough time to catch up. It is suggested to descend in the water at a rate that your body can handle. You may, also, want to look up while you are descending. This can help with the transition. Ear pain usually comes if you have respiratory issues when you go diving. You want to make sure that you do not eat anything that will increase mucus production in your body, such as dairy products. You also want to avoid diving if you have a cold. Although cold medicine can sometimes help, it is best to still wait until your cold clears up. Additionally, you want to go through the equalization process throughout your descent in the water. You can start this before you even enter the water, by slowly blowing out of your nose. It is suggested to be gentle with it and descend at a slow rate. The deeper you go down, the more you will need to equalize because the pressure will get stronger. Making sure that your diving mask is clear of water at all times can also help with the prevention of ear pain. This can help keep your sinuses clear, so you do not produce large amounts of mucus while you are underwater. This will make the process of equalizing successful. Most importantly, you want to be gentle with your ears while you are underwater. This is said to be the number one rule in diving. When the pressure equals out, you will feel the difference. Diving is a sport that many love to take part in. When divers decide to head into the abyss of the ocean, sustaining proper health can make all the difference in the world. Understanding why ear pain develops, acting on the pain, and preventing it before heading into the ocean can help make any diver’s experience more enjoyable and successful, in the long run.